So if you've been invested in the stock market over the last year or two, congratulations! You're likely sitting on double-digit returns from the incredible bull market we've seen during that span. The last thing you want to do is watch those gains slip away. We're not making any prediction here, but experts are pointing out plenty of warning signs that a market “correction” is inevitable. We gave you five of those warning signs in a recent EVG Research team article. Fortunately, there are also specific ways to protect and preserve the profits you've already made. Today, we'll reveal 3 ways you can “lock in” whatever gains you've made so you don't have to worry about losing them. Before we get to those methods, let's just take a quick trip down “market history lane” to show why you may want to take action sooner rather than later. Last week our research team plowed through a giant spreadsheet using the historical performance of the S&P 500 going back to 1928. The idea was to determine how frequently the stock market crashes… and the data was quite alarming. But first, a few definitions are in order. -A “Dip” is when the market loses at least 5%, but less than 10%. Traditional financial advisors consider dips a normal part of the ebb and flow of investing in the stock market. They occur around twice a year on average. -A “Bear market” occurs when the market loses more than 20% during a downturn, often leading to a recession. These definitions are not set in stone, but are common terms used by stock market pundits. A “crash” is when the market falls at least 10% in one day. For example, during the October 1929 crash, three out of four consecutive trading days had such 10% daily losses. So how frequent are “corrections”? Stocks have “corrected” at least 10% from a recent high 89 times during this time period. That means a market correction occurs once every 11.6 months on average. Stocks have declined at least 20% twenty-one times, or roughly once every 4 years. The stock market has declined at least 30% nine different times, or once every 9.5 years on average. Obviously, these events don't happen on a clock-like schedule. Still, the longer the market goes without a correction, the more people start looking for the inevitable. So the big question is, when's the last time we've had a market correction? Remember, they occur every 11.6 months on average. As the chart shows, we've had 10 “dips” since the March 2009 “bottom.” (that includes the 5.8% dip to start 2014, which is not shown on the graph). 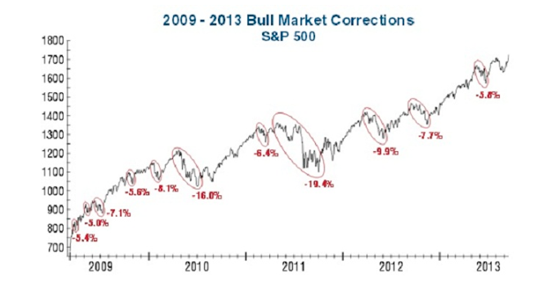 However, we've only had two market “corrections” in the last 5 years … and it's now been 29 months since the last one! That's 18 months “overdue” according to averages. Here's another interesting tidbit … during that 86 year timeframe we looked at above, the longest span without a market correction was 35 months, which occurred in the early 1990s. The current “correction-free” bull market we're in is the second longest in that span. And that's making the experts on Wall Street nervous. Because they all know a correction WILL come. They always do. And the experts agree: the longer the delay, the bigger the fall. This is a technique promoted by many stock traders and investors, including Stansberry Research. A trailing stop simply means that you make a “rule” for yourself to sell off your stock once the price goes down a predetermined percentage from it's most recent high point. Here's an example. Let's say you invested $100,000 last year in the S&P index. It would now be worth $130,000, or a 30% gain. If you set a 10% trailing stop now, you would sell if the value dropped to $117,000 (130k – 10%). In terms of the S&P's recent high at 1850, you'd sell if it drops to 1665 (1850 – 10%). This would lock in no less than a 17% gain. Of course, if the stock market continues to rise without a correction, your 10% stop rises along with it, and so does your guaranteed profits. Rebalancing is a technique used by professional money managers, and can be done in several ways. Using the example above, if you invested $100,000 last year and it is worth $130,000 now, you simply sell off $30,000 worth of stock and pocket your profits. You can then either use that $30,000 for whatever you want, or reinvest it in something that can't lose value, like a Cash Flow Bank account (one of the many investing strategies of the rich). This is an advanced technique, but is the most powerful one and is used by hedge fund managers and other professional money managers. One easy technique is selling call options against your existing shares. For example, shares of the S&P are now trading just above 1800, and the recent high on January 15 was at 1850. Using a “covered call” technique, you could agree to sell a your shares to someone else in June of this year at 1850, and you will get a “premium” paid to you right now. For your $130,000, you'd get paid around $3500 right now. If the price of the S&P stays below 1850, you keep the $3500 and this cushions any other loss you might incur. If the price of the S&P goes higher, you must sell your shares at 1850, which still locks in your current 30% profit, plus you still get to keep the $3500. Another stock “hedging” technique involves buying a protective PUT to protect your losses. In our example, you'd buy a June 2014 PUT at 1850, which gives you the right to sell your shares for 1850 any time before expiration day in June. So now matter how low the S&P falls (even if it's 20% or more), you still have the right to sell all your shares at 1850. This protection comes at a price. It will cost you around $4000 out of pocket today to buy those protective puts for the $130,000 example we're using. And if the the S&P keeps going up, you'll lose the four thousand (but keep the stock). If you have earnings from the stock market, now is the time to take action to protect your profits. Whether you use one of the techniques we outline above, or whether you just spend some time investigating other possibilities, it's well worth the time and effort to educate yourself. After all, it's your money and you want to watch it grow, not evaporate in the next market downturn.